Only two or three have moved (I didn’t keep a precise count of changes) so if you had a bin last year the chances are good it is back. And I added a further dozen or so locations to the map. Wandsworth will still be gritting. Many (I think deliberately in some cases) think this means the council won’t grit pavements. The council will still be gritting as normal, however, this allows residents to look after themselves and their neighbours should they choose – it’s an extra, not a replacement. Any errors in the map are mine. I took the information from the council’s winter service plan (PDF). While in some cases I’ve been able to use my own local knowledge to make sure it’s accurate, I don’t know the whole borough well enough to do that. 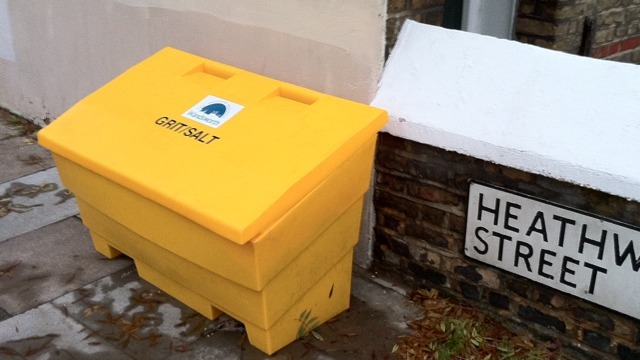 However, the grit bins are big yellow things, so this map should guide you close enough to see them. [You can download the data I used to make this map (location, longitude and latitude) from my data page.